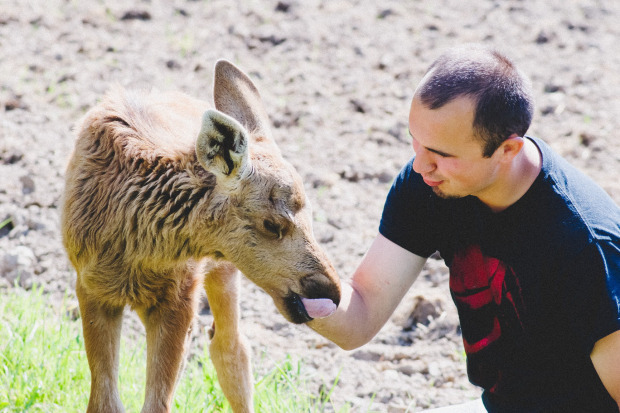 One day, Erikas Plucas came back home to find a baby moose lying alone outside his gate.She was starved, filthy, and terrified. As Erikas approached she tried to get up and run, but was too weak to even stand. 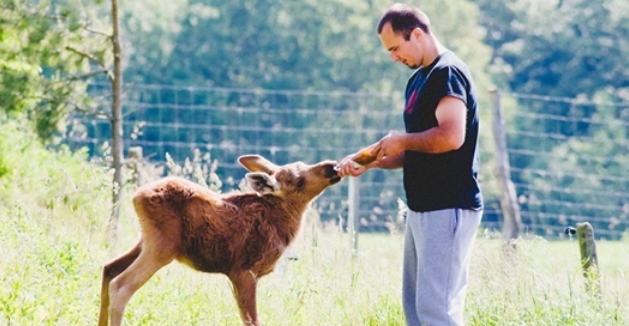 Erikas did what we’d hope anyone would do: he took the moose in and nursed her back to health. Erikas believes that the moose’s mother had been shot by hunters, and that she had run off alone in search of help. 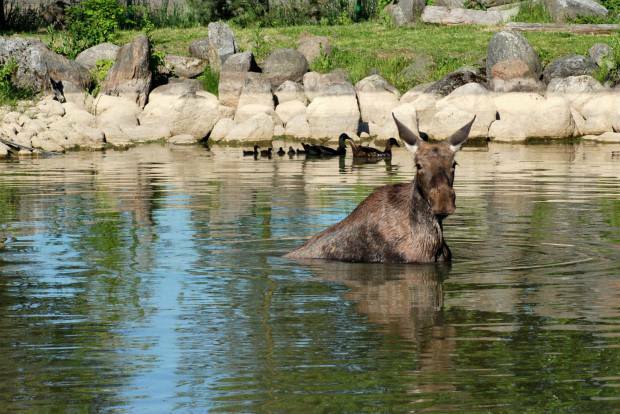 Erikas called animal services and asked his friends what he should do, but was told to leave the moose alone. He couldn’t do that. Erikas began by gathering leaves and getting some milk, desperately trying to get the moose to eat. When animal services arrived the next day, they told Erikas that there wasn’t anything they could do, other than calling local hunters and putting the moose out of her misery. 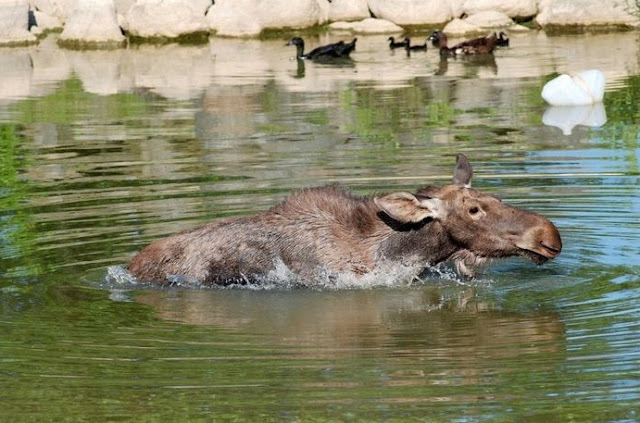 Erikas decided then that he would do whatever it took to make sure the moose survived. He told animal services that he would keep the animal, and set to work on bringing her back from the brink of death. 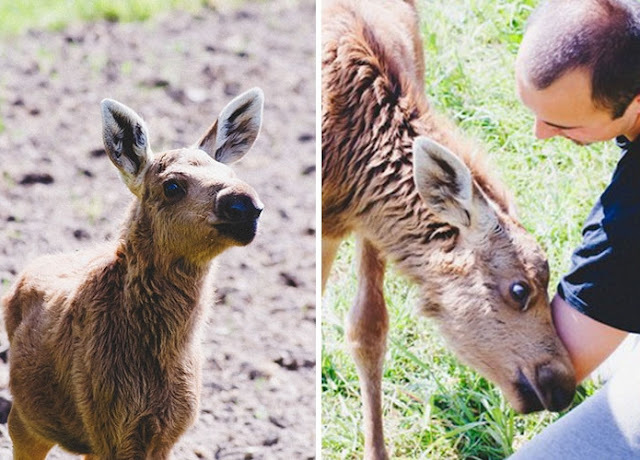 He named the moose Emma, fed her every four hours, and often slept outside next to her so she would feel safe. As she grew bigger and stronger, Erikas took Emma into the forest for daily walks in the hope of reintroducing her to the wild. He showed her how to find food, providing comfort whenever she got scared. ‘She was afraid of everything but me,’ said Erikas. Eventually Emma gained confidence and was ready to move out in to the forest full-time. She left Erikas’ home for the forest, and stopped needing to sleep by his gate every night. But even though she’s all grown up, Emma still comes back to visit Erikas every day. Responses to "Emma the moose visits the man who rescued her every day"
ears back, getting a little frustrated at being filmed, I think !!! Won't the bell attract attention? bears, coyotes and such. Yes, it tells hunters where she is also. They just take the collar off. Not a good idea and plus, won't she kind of just stand and look at people wondering about them instead of running for her life?